The Wiggle Noggin (宇宙ネコ目?) is a treasure in Pikmin 2. 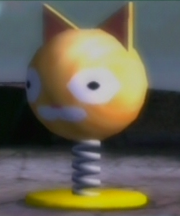 This bobble-head cat is located on sublevel 9 of the Cavern of Chaos. Gas pipes dot this level, as well as a few enemies, all of them flying: a Bumbling Snitchbug and a couple of Careening Dirigibugs. The treasure is easily within view, as is the sublevel's only other treasure, the Maternal Sculpture. Location of the Wiggle Noggin. The Wiggle Noggin being analyzed. This page was last edited on December 12, 2018, at 08:45.